How Much: Reservations recommended with information on their website. “Rossi & Rossi is pleased to announce Hell on Earth, contemporary Cambodian artist Leang Seckon’s second solo show with the gallery. 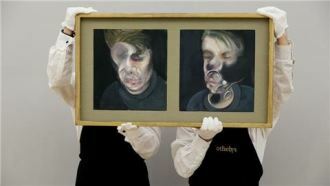 The exhibition, held at Asia House, London, features a body of recent paintings, collages and video works by the artist. Seckon grew up during the devastating period of Khmer Rouge rule, witnessing firsthand the government-enforced policies that led to famine and disease, as well as state executions. He describes this period as “hell on earth”, when the haunting prophecies found in a set of popular nineteenth-century Buddhist texts, the Buddh Damnay, were realized: “war will break out on all sides…blood will flow up to the bellies of elephants; there will be houses with no people in them, roads upon which no-one travels; there will be rice but nothing to eat”. The prophecies provided Cambodians with an explanation for the violence and destruction of the Khmer Rouge, placing the period within the cyclical pattern of Buddhist history. The artist’s collages and paintings are intimate narratives of his memories from the period and the civil war that followed. The process of creating artworks simultaneously allows him to experience and express the freedom that was denied to him as a youth. However, Seckon’s work also acts as a warning: like the Buddh Damnay, it cautions against corruption and the destruction of the environment, drawing parallels between Cambodia’s present and its past. A fully illustrated catalogue with an essay by renowned curator Jens Hoffmann accompanies the exhibition. “On a white sheet of paper, Tessa Groshoff spills her secrets. She swirls, lines and scribbles to tell her stories in the universal language of art that words simply cannot convey.